Agree with the above quote? Hell yeah! When it comes to living life King size, why settle? Sure, life is all about finding happiness in little things. But believe it or not, we all secretly wish for a world full of luxury to dive into whenever we feel like. We spend most of our time in our humble abodes and the best way to feel luxurious every day is to make some quick changes to our crash pads. How about we walk you through some practical hacks that can make your home look all glam? Let’s get started! In a rush? You can download our visual guide at the end of this article. But... we highly recommend your check the entire post first! Hacks To Add The 'Glam' Factor To Your Home! Here are some simple ways to glam up your home. As they say, the first impression is the last impression. Let’s make sure anyone who sets foot in your little luxurious apartment is bowled over at the first sight. Invest in your entryway by adding eye catchy vases with beautiful flowers. Make it look inviting with a tall lamp that emits warm light. A dark wooden background table lends an exciting look to the overall entrance scene. You can also try this look if you want to add a Zen-like atmosphere to the entry passage. A serene looking sculpture along with a little green will greet anyone with a calm experience and make their day! Time to change the old sofa layers and get all glamorous with some lush velvet! Velvet fabric adds richness to your sofa like no other and transforms an otherwise dull looking living room to something splendid. Try dark colours like royal blue, purple or even subtle ones like grey, beige work just great. Teaming it up with some vibrant cushions will be the cherry on top of the cake! Twinkle Twinkle little star…point me to the nearest Bar! Get yourself a small cart and convert it into a mini bar in one corner of your house. The blingy 'Happy Hour' sign spreads positive vibes and is sure to make all your guests feel great! Place it over a fur rug to give your bar a warm feel. Trust us you are going to thank us for this one! A Bar cabinet neatly stacked with all that fancy liquor will drive away all your mid-week blues! Buy some fine tall glasses and let’s talk about going all glam! 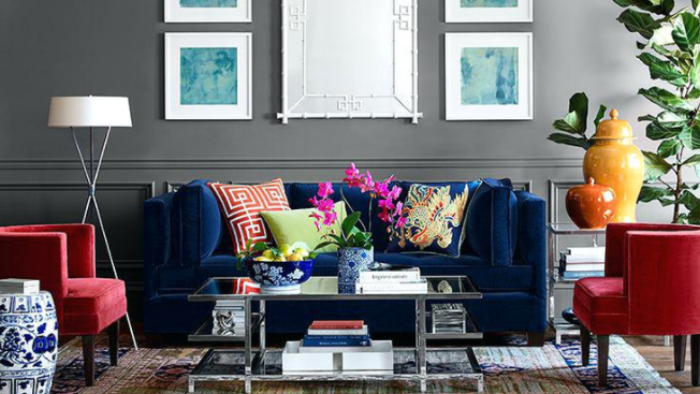 Cover the empty living room wall with a large sized mirror. 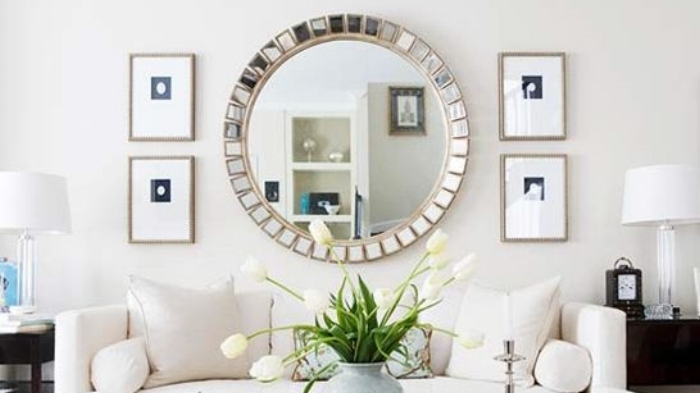 A mirror gives a luxurious feel and helps the room seem bigger. Go for contemporary styles that are modern and look elegant. Experiment with fun and quirky ideas. Remember, getting a glam house requires going that extra mile. After all, the end result is all that matters. Lights play an important role when you are looking to add glamour to any room. Depending on the space available, you can opt for a grand chandelier or install small lamps against a rustic wall as shown below. Play with different lighting fixtures and styles and watch the area come alive. Place decorative pieces inside hollow shelves with lights flooding over them. The result will be a sophisticated wall of art created just by adding the golden glow! Organise your Books and everything fancy in a double ladder bookshelf. It not only utilises the extra space in a room beautifully but also solves the functional problem of putting all the random and pretty little things together in an orderly fashion. 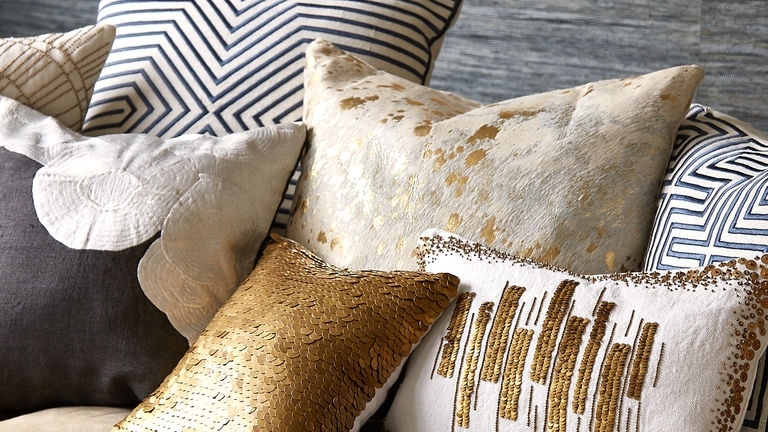 Who would have thought that placing your pillows in a certain manner could exude glamour? Collect throw pillows of various colours and textures. They are easily available off the internet or retail stores at affordable prices. Keep an eye out for bargain fleas happening near you as you can pick them up at half the usual rates. The empty corner of your bedroom can be filled up with a small sized couch. It acts like a cosy getaway from the mundane bed that you sleep in. Funky prints like black and white stripes combined with glitter cushions will give a glam look to your room. Let your creative side work and don’t hesitate to mix and match different pillow designs. Vintage is in! Add a touch of luxury by introducing a piece of old world charm to your home. Accent Chairs look classy as a part of your Living room or Bedroom. You will be amazed with the transformation it brings about and makes your home feel all glamorous! What do we miss the most about our hotel when back from a vacation? Not the bed (well, that too), but the oh-so-wonderful and lavish bathrooms! It is one place where people like to retire for a few moments to clear their heads and escape from this maddening world. Neatly stacked towels, toilet paper and a small wicker basket for storage give the bathroom an elegant feel. Add a little indoor plant to provide a natural look. Use an attractive mirror and make it the focal point of the bathroom. Install lights right over it for a warm glow. Choose a modern design for the washbasin. 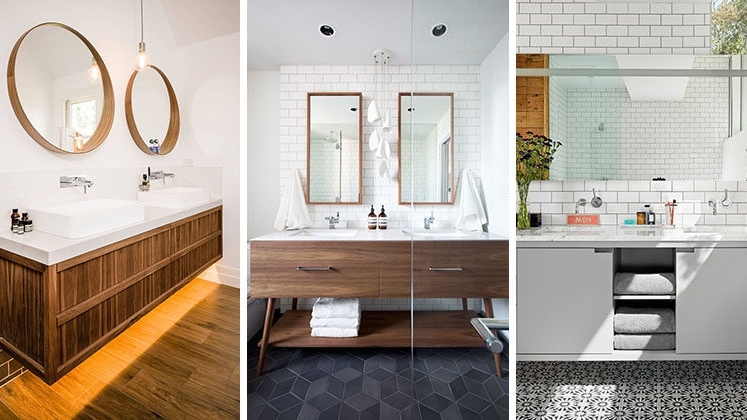 Sometimes minimalistic décor lend a very sophisticated aura to traditional Bathrooms. You can use rugs with interesting messages to add an element of fun to the decor. Scented Candles are chic and look extremely elegant. Get those unused bird cages out and use them to burn bright, colourful candles. Table-top candles instantly up the glamour quotient of any room. It is one of the easiest and cheapest ways to let your house shine with a warm radiance. That’s about it! We hope you found these hacks useful and the next time you find your home all dull and uninteresting, you know what to do! Speak to an expert for quick advice on how you can incorporate these ideas that blend right in with the Interiors of your house! Go find your Glamour! 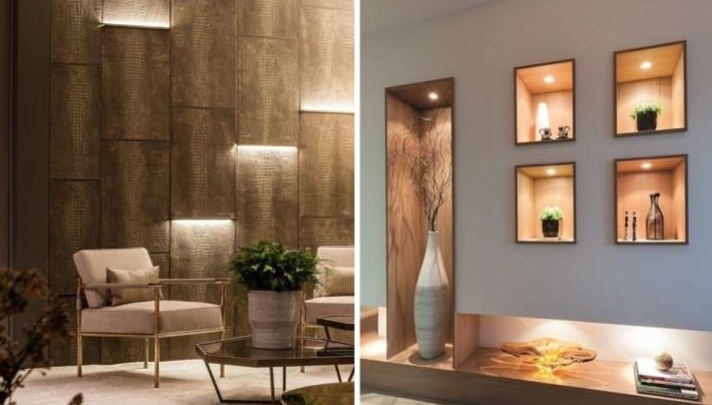 Newer PostHere Are 10 Interior Design Trends Which Will Dominate 2018! Older PostHow To Design A Kids' Room They'd Love And Thank You For!